No, no. We’re not talking about stitching with mirrors involved – as in Shisha embroidery (though I do have a Stitch Play coming up on that!). Here, I’m using “mirror” as a verb. 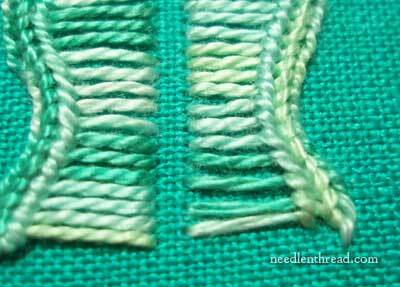 Today, I’m suggesting that you play around with your stitches by mirroring them. That is, work them opposite each other. 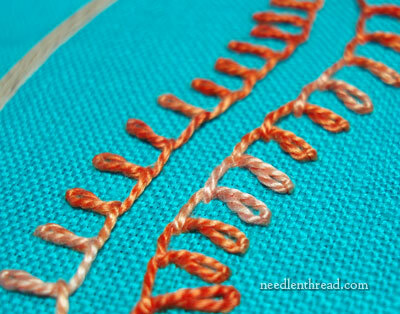 Mirroring a row of embroidery stitches is a good way to create an interesting border or heavy line. In the photo above, for example, I’ve mirrored two lines of Mountmellick stitch, keeping the “spines” of the stitch lines in the center and the “spokes” pointing outwards. I’ve done the same thing in the photo above with Pekinese stitch, keeping the trimmer parts of the loops to the inside and the fuller to the outside. Any buttonhole variation works well this way. The stitch above is basque stitch, a stitch that combines a kind of upside-down buttonhole with twisted chain stitch. 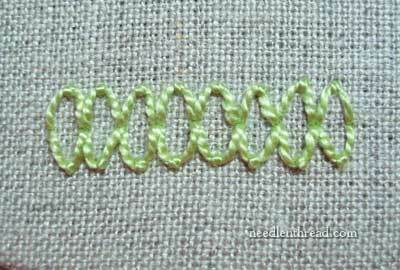 When you mirror your stitch lines, you can leave the channel between them blank, or you can fill it up with other stitches. In the photo above, I’ve used basque stitch, mirrored, and worked a line of running stitch up the middle. Up and down buttonhole is another stitch that mirrors well. There’s some nice space between those two lines for further embellishment. 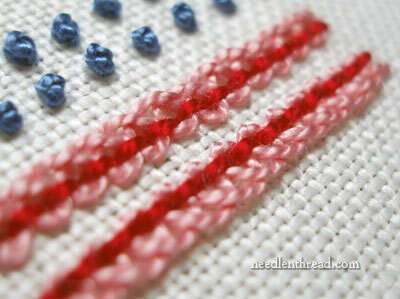 French knots, for example, would look really good tucked in between the “scallops” formed by the up and down buttonhole. 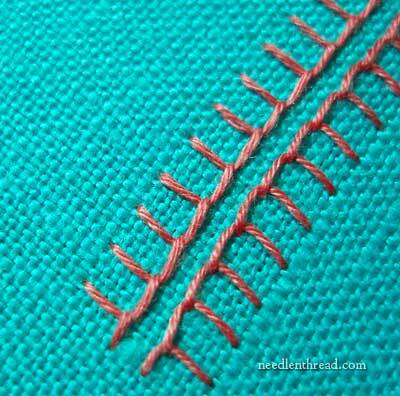 Don’t forget plain old buttonhole stitch! Here, the mirror is done opposite, with the “teeth” of the buttonhole combs pointing towards each other. The buttonhole stitch has been whipped, to add more bulk (and a pretty effect, I think!) on the “spine” part of the stitch. 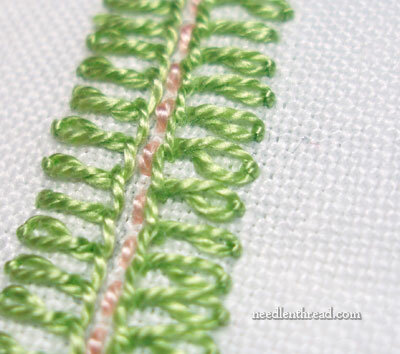 Above, you can see two lines of the same horizontal fly stitch coming together where each stitch begins and ends. The tips are rounded now, not pointed. But it’s the same stitch. 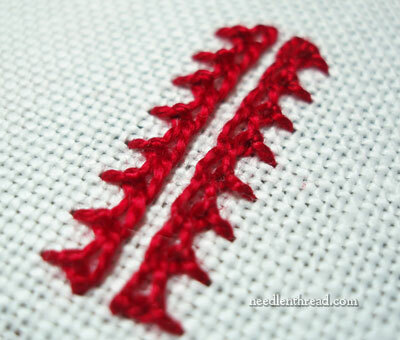 So, here’s a suggestion for some Stitch Play: try mirroring your lines! See what kind of interesting effects you can create. 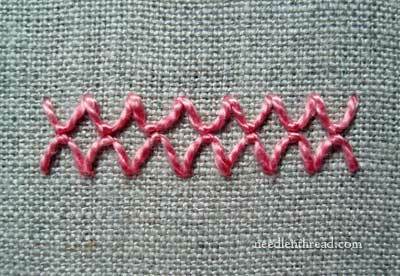 Use the mirrored lines as a base for further embellishment, too, by adding running stitch, knots, or other little stitch elements to your mirrored lines. Go ahead and try it! It’s Fun Stuff!! I love Stitch play – it’s so inspiring!! I have been wanting to let you know how much I enjoy the Stitch Play series. As a crazy quilter, I’m always looking for a new seam treatment. Thank you. I love, love, love the Stitch Play series. It always gives me ideas for my doodle cloth and the ideas ultimately end up in a design or embroidery. Thank you so so much and please keep up this vibrant new series! Thanks so much for the stitch play series, I really enjoy it there’s no end to stitching as you are showing us, I will certainly have to practice these stitches and play with them as you suggest. Hi, all! I’m so glad you’re enjoying the Stitch Play series! I hope it doesn’t become… well… Boring! I’m in the process of getting some other larger projects underway, so I’ll be interspersing Stitch Play among the project updates. In the meantime, I’m working like a fiend to get the video collection updated. Once all the videos are updated, I’ll have more time to devote to big project updates. Thanks for your comments – they are always appreciated! I LOVE your stitch play! The combinations are really pretty and possibilities near endless. Thank you! Stitch Play is always so inspiring! I have a crazy quilt project to work and this is giving me lots of ideas. Mary, thanks for this series. 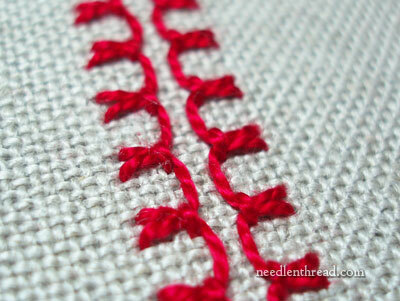 I love the ways these stitches look mirrored–such a simple variation, and it looks great. I’d love to see the fabric you’re working these on– are they randomly placed, or is it turning into a sampler as you play? I also just LOVE your stitch play series – keep them coming! Don’t ever think it would get boring – you keep inspiring us with your creativity. Thank you! Never say boring, Mary. It is fascinating how many ways people can find to use all these stitches, and yours are always so imaginative and beautifully presented – they make me want to start a sampler. The trouble is that it would probably end up being like Sharon Boggon’s – about 10 miles long! I can’t wait to see what you do with shishas and perhaps, please, cabochons? Hi, Mary, this is a great subject. So, how do you mirror exactly? Do you stitch a row one way, then turn the work and stitch back? Or is there a “backwards” way of achieving it? Probably overthinking, but it’s the details that tend to hold me back. I didn’t know their was so many beautiful embroidery stitch out there. I am excited to be able to find some. I did get a book. I am anxious to get Chicken scratch stitches, next. as years ago I did a quilt on the star chicken scratch. I have been doing more quilting now, but getting back to embroidery. Thank You for your web site.